This vanity set was a bland as could be. A medium “oak” finish and ho-hum fabric did nothing to make it a focal point in any room. But, its small size made it a perfect candidate for a remake – a quick project that could fit in nearly any space. 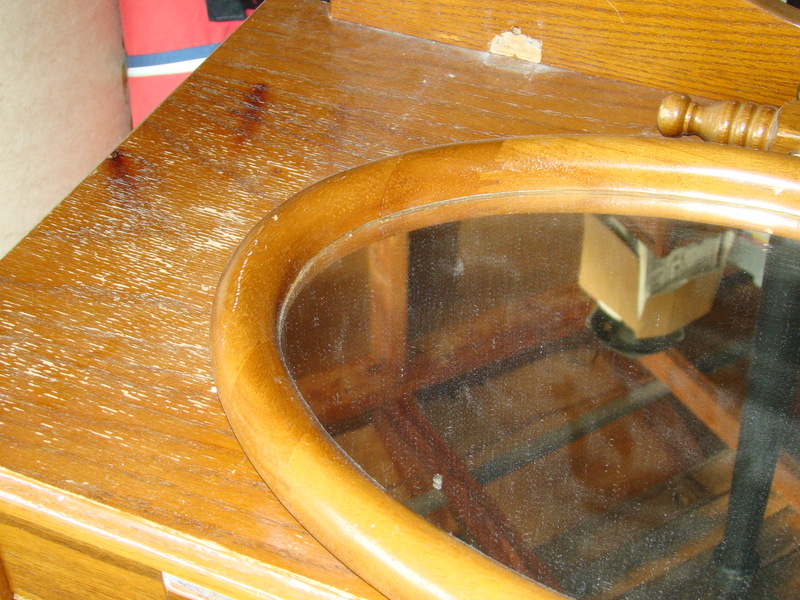 The top of the vanity was in rough shape…with a few curling iron burns thrown in for good measure. 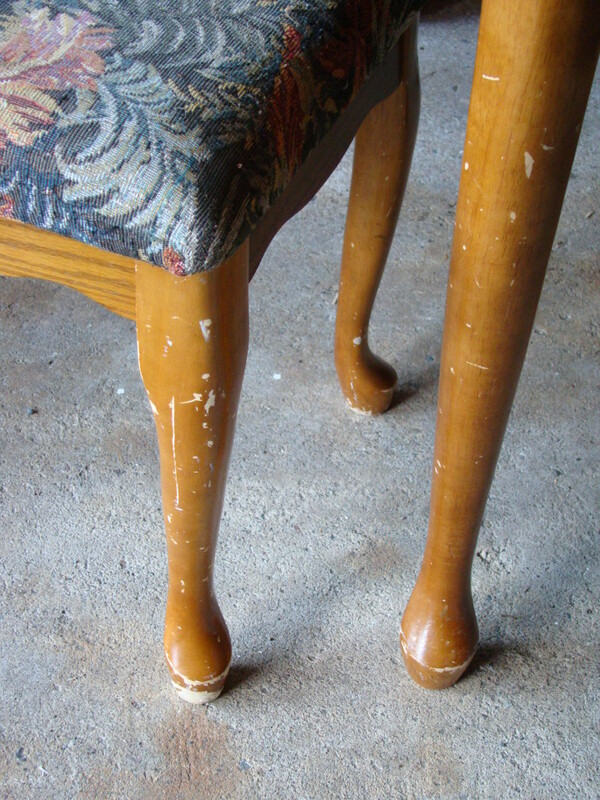 These scuffs would be easily covered with a fresh coat of paint. 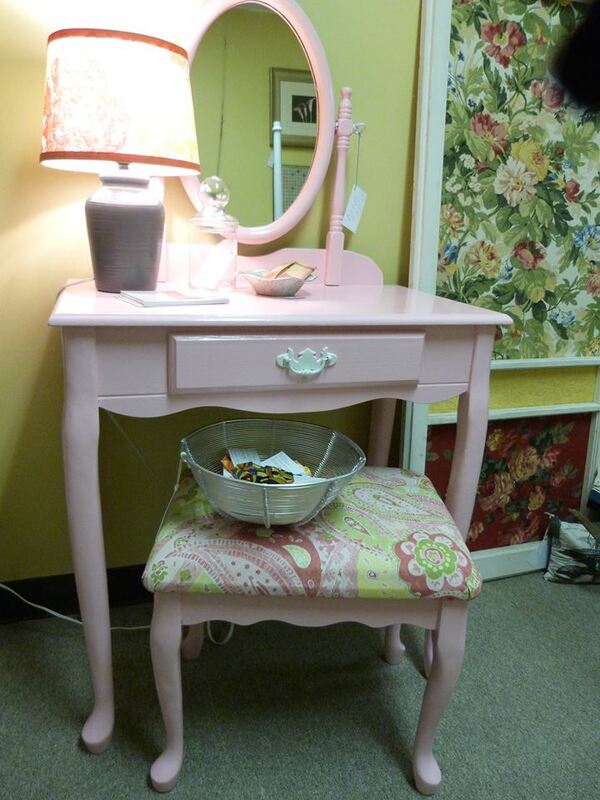 And, a super-cute paisley fabric for the stool would complete this ensemble. I just unscrewed the seat from the base before I began painting, covered it with the new fabric by pulling it taut and stapling underneath, screwed the seat back on after the paint dried and voila! Easy peasy. 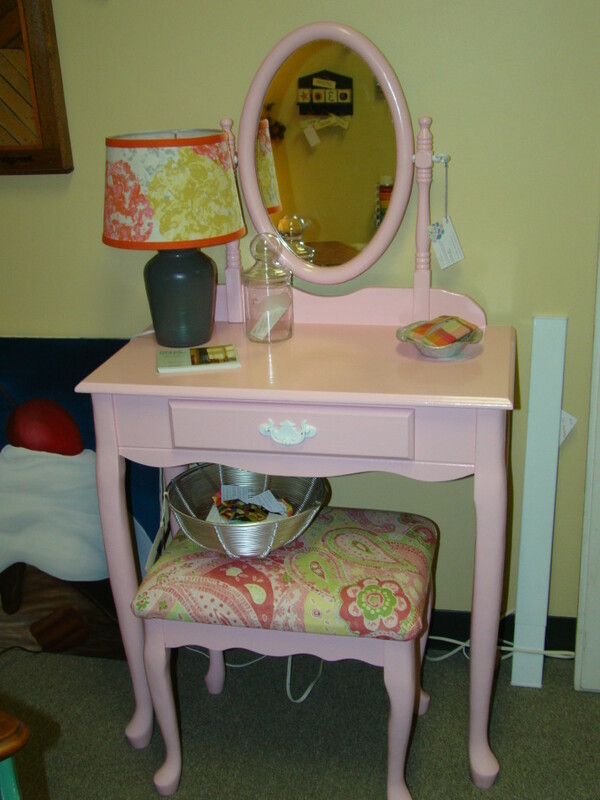 This cute little vanity was just crying out for some new paint, so I chose a fun, perky shade of pink that any girly-girl would love. First, I sanded lightly with 200-grit sandpaper and my handy-dandy Mouse Sander, wiped it down with a damp cloth to remove the dust, then primed with Zinsser primer. I ended up coating with 3 coats of paint, letting each dry thoroughly before recoating. 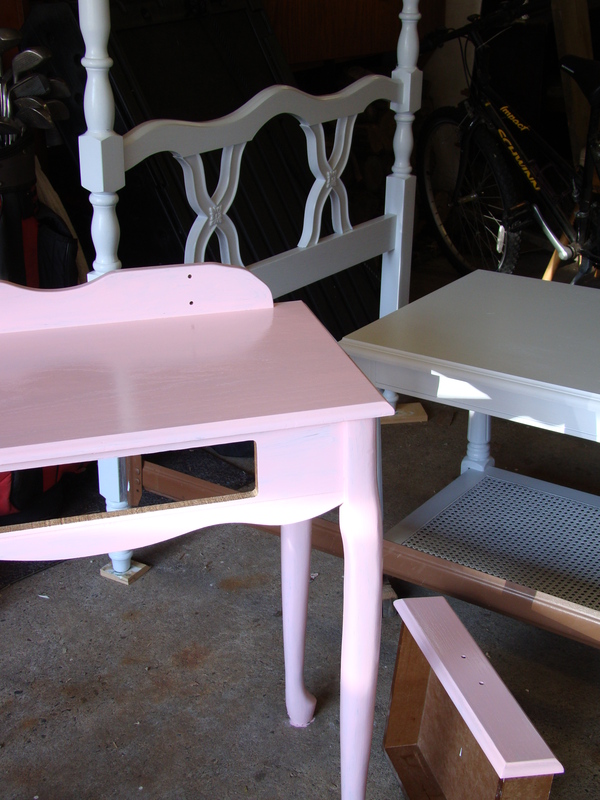 I used oil-based paint for this project in a semi-gloss finish. Although it’s smelly and clean-up is a bigger headache, I do find that it holds up to more abuse in the long-run. It covers beautifully, minimizing the look of brush strokes more than latex paint does. But, I have used latex, too, and either will work here. You can see I had a few projects going at once. The black four-poster bed from the top photo has turned white, along with two darling end tables with caned shelves on the bottom. Such a cute bedroom for a little girl! But, I digress…on to the “after” picture! 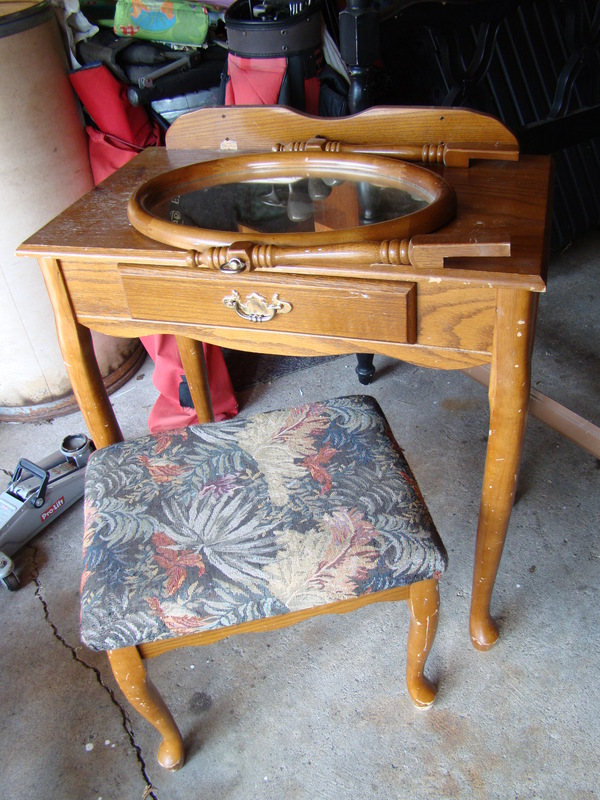 Here is the finished vanity, complete with newly-painted white hardware; I thought it would be a much better fit than the original brass. Do you love it? It do! My daughter does, too – she wants it in her bedroom. But, since I already custom-painted a piece for her bedroom, this one is heading to my shop to grace another girl’s room. I hope she loves it, too!